King Cake, which more closely resembles a rich, sweet bread, is the preferred dessert in New Orleans during Mardi Gras. 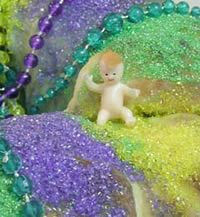 The making of King Cake honors the coming of the three wise men who brought gifts to baby Jesus. The three colors of the sugar used to decorate the cake are purple (representing Justice), green (representing Faith) and gold (representing Power). A plastic baby is placed inside the cake, and the tradition is whoever receives the baby in their piece of cake must buy the next King Cake or throw the next party! Some King Cakes have cream cheese or jelly filling. This is a recipe for traditional, unadulterated King Cake. WARNING: Be sure to warn your guests that there is a plastic baby in the cake! 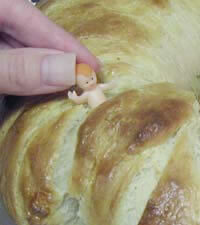 a 1″ plastic baby (tiny plastic dolls available at cake decorating, hobby shop or novelty supply. Combine 3 1/2 cups flour, 1/2 cup sugar, nutmeg, salt and lemon peel in a large bowl and set aside. Pour warm water into a small shallow bowl. Sprinkle yeast and 2 teaspoons sugar over water. Allow the yeast and sugar to rest for 3 minutes, then mix thoroughly. Set bowl in a warm place until yeast bubbles and mixture doubles in size, about 10 minutes. Make a well in the center of the flour mixture. Add yeast mixture, milk, egg yolks and one whole egg into the well. Slowly combine ingredients with a sturdy wooden spoon. Stir in softened butter until dough forms a medium-soft ball. Place ball on a well-floured surface. Knead mixture as you would bread, gradually adding flour 1 Tablespoon at a time, until dough is no longer sticky. (Only add as much flour as necessary to achieve this state, but no more than 1 cup.) When dough is no longer sticky, knead for 10 minutes more until shiny and elastic. Coat the inside of a large bowl evenly with softened butter. Place dough ball in the bowl and rotate until the entire surface is buttered. Cover bowl with a kitchen towel and place in a draft free spot for about 1 1/2 hours, or until dough doubles in volume. When dough has risen, remove place on a floured surface. Using your fist, punch the dough down forcefully. Sprinkle with cinnamon and knead for 1 minute. Form into a cylinder, then twist this cylinder into a circle. Pinch the ends together to complete the circle. Once again, cover and let rise until doubled, about 45 minutes to 1 1/2 hours. Preheat oven to 375 degrees. Brush top and side of cake with egg wash and bake on middle rack for 25 to 35 minutes until golden brown. Place cake on wire rack to cool completely. Once the cake has cooled, insert the plastic baby at this time. Mix confectioners sugar, lemon juice and 3 tablespoons of water until mixture is smooth, adding more water as necessary to achieve a smooth, spreadable consistency. Spread icing over cake and immediately sprinkle colored sugar in alternating color rows. Serve in 2″ – 3″ slices. This entry was posted on Wednesday, September 12th, 2007 at 2:00 pm	and is filed under Holiday & Seasonal, Master Recipe Index, Vegetarian. You can follow any responses to this entry through the RSS 2.0 feed. You can leave a response, or trackback from your own site.